2 of 6 Place potatoes and onions on a baking sheet and toss with the olive oil. Season with the salt and pepper. Bake at 450 degrees F for 20 minutes or until tender, stirring halfway through cooking time. 3 of 6 Meanwhile, place 4 slices of bread on a work surface and spread each with 2 teaspoons of the mustard. 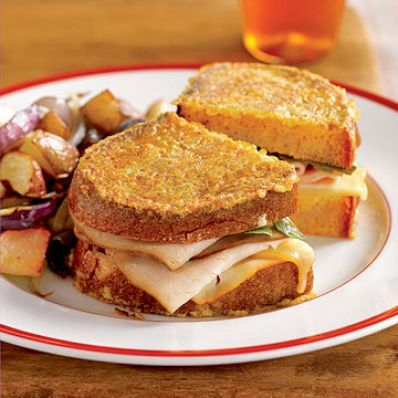 Equally divide the turkey and cheese over each bread slice. Top each with 3 pieces of arugula and the remaining bread slices. 4 of 6 In a shallow dish, beat eggs, milk, cayenne and nutmeg. 5 of 6 Heat a large nonstick skillet over medium-high heat. Add 1 tablespoon of butter; when foamy, dip 2 of the sandwiches in the egg mixture and add to the skillet. Cook for about 3 to 4 minutes per side or until nicely browned. Remove sandwiches from skillet; keep warm. Reduce heat to medium; repeat with remaining butter and sandwiches. 6 of 6 Serve the sandwiches immediately with the roasted potatoes on the side.